Stock available EU UK USA DE warehouse ,there will have remote charges if shipping address is remote. 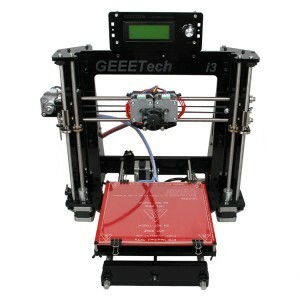 Geeetech I3 pro W 3D printer, is engineered and manufactured by Shenzhen Getech Technology Co., Ltd. Compared with other Geeetech I3 pro printers, the whole frame of I3 pro W, made of high-quality wood, is greatly simplified and portable. 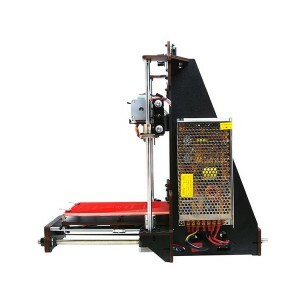 Its DIY design would bring great sense of accomplishment when you see a whole machine walking out of fragmentary parts. Unleash your bold ideation with the company of I3 pro W.
8. EasyPrint 3D App: coming with printing and control functions, a gallery of free 3D models and 3D printing community. 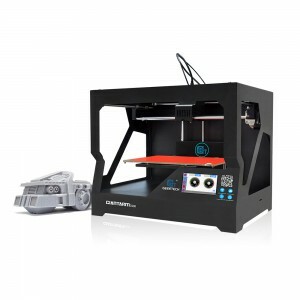 Together with Wi-Fi connectivity, EasyPrint 3D App provides you with satisfactory experience of Cloud 3D printing era. 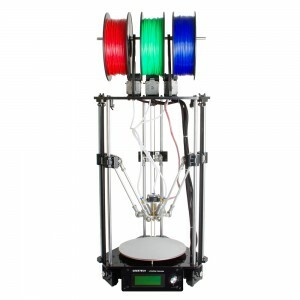 1 x I3-W3D printer kit. Hi I mounted the printer and the extruder don't work, I mean, it heats, it moves but i cant put the PLA through it and it doesn't do anything. Hello, I ordered (02/22/2019) a printer with 3D-WiFi and 3D-touch. Today I received only 3D-WiFi and 3D-touch. 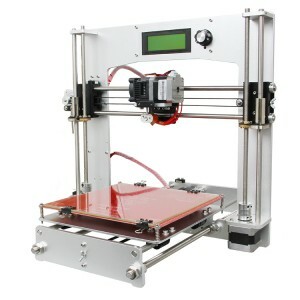 How I can have more Information about 3D printer? I sent E-Mail and a message on Skype but noone give me an answer. can you please send me order number? I tried everything everything, but the extruder didn't work. If my layer height is higher than 0.3mm the extruder motor skips("click, click, click") I looked at the forum, but the advice still not work. Just received this as a gift (bought from amazon). Installation and preparation all ok. All axes moves very well using the local control panel and the "About command report firmware 1.0.05. I am using a mac, so downloaded the repetier-Host mac from https://www.repetier.com.If I use it (on lpss-serial1) the program says "unknown firmware", shows commands waiting right on connection and does not control anything (heater, hotbed, movement,...). I tried to change all port speeds to no effect. What am I missing? Should not the system be ready for connection? El extrusor se atora continuamente. LLevo comprados 5 extrusores y no hay manera de que la impresorafuncione correctamente. ¿Que me recomienda hacer? Acaba de atorarse el último que compré así que no puedo trabajar más con mi impresora. recieved this product yesterday and began to build it today. one of the parts (NO.38, z-axis couplers) is incorrect. where is the point of contact to get this resolved and the correct pieces shipped? Can i order this printer with a 3mm setup? hello , what' the latest firmware for i3 pro W Thanks L.
i bought this kit. Finally assembled the whole printer and it have a issues.the Z-axis makes a grating sound Any help would be appreciated. 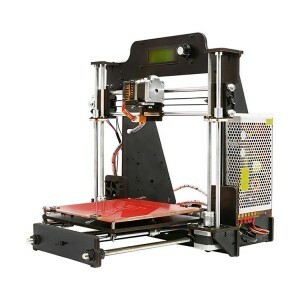 Hi, New to 3D printing so bought this kit. Finally assembled the whole printer and have a few issues. 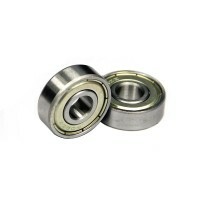 One of the Linear bearings is faulty and doesn't move smoothly along the rods under the build plate. Both the brass Z-Axis nuts are faulty and the screws cannot connect straight. 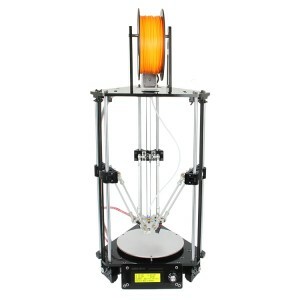 Once built the X-axis works fine, but the Z-axis makes a grating sound and the Y-axis doesn't respond at all. Any help would be appreciated. In the building manual at page 49 it is writte: M3 x 6mm screw	No. 21	8	, but in video i see ionly 6 screws 4 for Z-axis nut and 2 for Linear Bearings. Is it the manual with a mistake or im loosing something? Hi Nicola, Maybe you are loosing something,please emial to :victory.lei@geeetech.cn for help.Thanks. I have bought it and I succeeded in mounting it. But it's really hard to print something. I have a Mac and I can't install the driver and I have tried lots of times to connect my computer to the printer but it seems all useless. Do you know where I can find an update list of instructions? Thanks a lot. Newbie to 3D printing, but like a challenge, so I bought this kit. I have it up and running now but ran into some problems along the way: 1. USB cable supplied with kit was defective. 2. Wrong USB to Serial chip listed and driver link in instructions. Eventually found some helpful posts to identify chip on my board and download the correct driver. 3. X-axis motor controller was soldered on to control board backwards. Looked wrong but assumed it was that way for a reason until the motor ran backwards. I removed plastic portion of connector and reversed it. 4. Bad driver board for the Y-axis. Voltage between GND and pot was either 4.98VDC or less than 0.01VDC - nothing between. Ordered replacement from Amazon - working correctly now. 5. Had to do a lot of digging to find information about setting the correct baud rate in the EasyPrint3D. Would have been helpful to have that in the user manual. 6. Bent Z-axis threaded rods. I have been able to straighten them out some. Any chance on having you send me some truly straight ones? 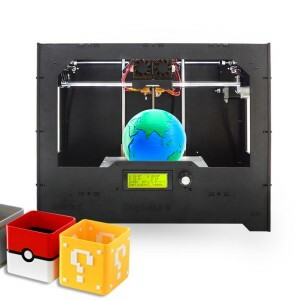 Hi, where do I find the QR code on the Prusa I3 Pro W to bind it to the easy3D app? 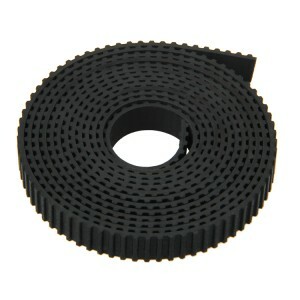 Hi, I have just printed the calibration cube and it is longer along one side. is this normal. Also i am having problems with teh print sticking. 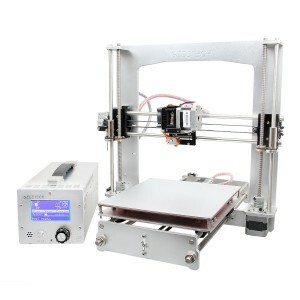 i have tried the following Decorators tape Lower bed temp hight bed temp higher extruder temp lower extruder temp still having issues with it moving. 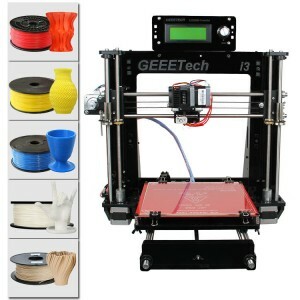 Hi LEE, Can u please send me picture of the tube you printed to jocelin.jia@geeetech.cn? For the sticking, which filament you use? 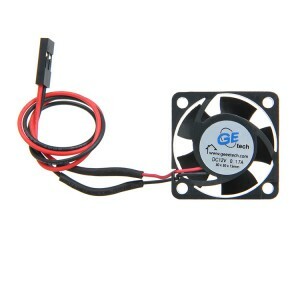 PLA or ABS,please note that the heatbed need up to 90dgree if ABS , PLA need 60-90degree. 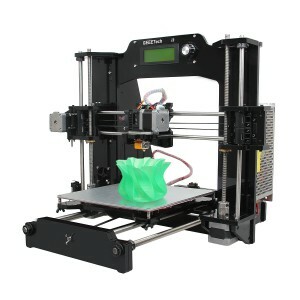 Hello, the forums http://www.geeetech.com/forum/viewtopic.php?t=17046 are down and I need to update to the latest Firmware for my new purchased Prusa i3 Pro W, help! The printer don't print with the pc. ¿How do I make? Thank you. Los drivers de los motores (4988)vienen ajustados? Hi i recently bought this printer but it there is no power from the PSU, all connections are good. 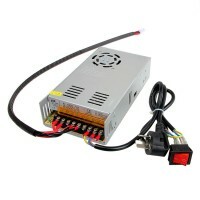 Hi recently bought this printer but there is no power output from the PSU, so nothing work. How do I remove filament from the print head? Thank you, I got it!. Why firmware is not up to date? Where the new firmware can be downloaded not something from 2015?!?!?! Can i buy dis printer in India ? Can i install mk8 dual extruder in dis model ? Hi lakhyajyoti,sorry for late reply.I wanna introduce you pro C,cause pro C have dual extruder.And you can order on the website,we will send it ti India.Thanks. What control software is available for MacOS to use with this printer? Are there setup instructions also for MacOS? I am not satisfied with it. Due to that there is a distributor in South Africa, they are so so expensive. Charge from you directly is R2157.37 in rand value. In South Africa they charge R7000.00 so total increase of amount they make is R4842.63. Surely i can import from you for R1000 or so. Why must i pay almost R5000 more in South africa. Hello. My order number is: 20171014231603584. The package identification number is: 538163697143. The issues are as follows: - tracking number is not identified in the system on the site that you have communicated although I have chosen and paid for this option -3D printer arrived without the 3D sensor Toutch Autoleveling even though it was paid -USBee Suite and Pro versions Logic Analyzer was not delivered even though it was paid. How do we fix these problems? Hi Alexandru ,sorry for the inconvenient here.For the printer we have stock in Germany warehouse so arrange from the local,but for the sensor we just have stock in China so be shipped from China by tracking number :RT367701136HK,pls note with thank. Hello. The 3D sensor Toutch Autoleveling and USBee Suite and Pro versions Logic Analyzer will be delivered both in the same packet with the tracking number RT367701136HK? In this case, according to the information displayed above on your site, the price for the printer should not be $ 159.9? I paid $189 for the printer + $24.16 for the Auto Leveling Sensor 3DTouch. Hi Alexandru,yes ,in the same box ,pls note with thank.For the price before you buy you can contract the sales ,if not sorry that .Next time when you would like to purchase something you can contract to the sales for some discount .Pls note with thank. What´s the difference to the i3 pro B? 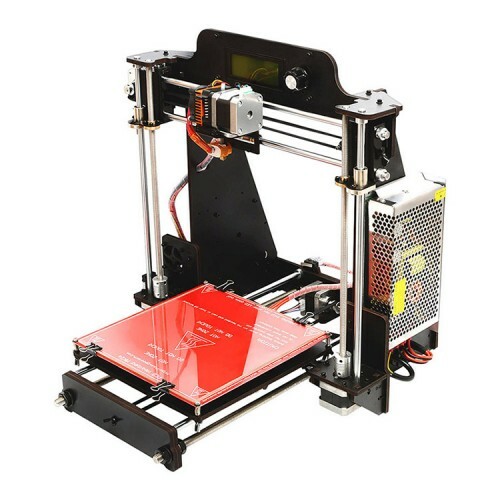 Hi Tim ,mostly the pro B and pro W are in the same just the pro B is acrylic frame while the pro W is the wooden frame .For both of the printers can support the auto leveling by 3d touch sensor ,just depend on which kind of material you are more prefer . can this printer be upgraded to dual extruder? 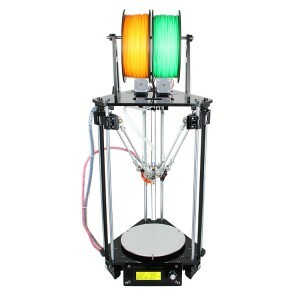 Hi Fran ,yes ,it can ,almost same as the pro B to update to the pro C dual extruder . Hi Martin ,yes ,this is our geeetech 3d printer .Also now have stock in EU warehouse .You can place order online and i will arrange ship from EU .have a nice day! The User Manual says to use EasyPrint3D. I'm using Windows 10 and it will not run EasyPrint3D. It says it requires .net 3.5, but no matter what I try (and I Googled and tried hours of stuff) it won't run. So how am I supposed to use this machine now that I've built it? 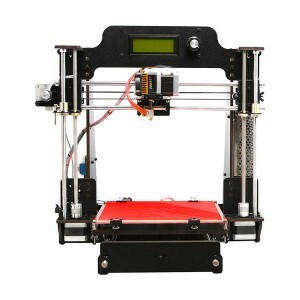 Hi, I Geeetech Prusa I3 Pro W, but I'm not locating the Wi-Fi module to buy. Can you tell me the model for me to locate? Hi Bruno ,sorry that the wifi module still on processing and will be ready soon,pls note with thank. the wifi module is still unavailable? otherwise where to buy and install instruction? 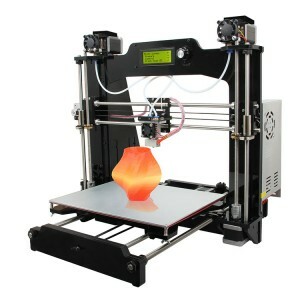 Hi Fran ,will be ready soon ,now we are testing all of our printers .Pls note with thank. Scam! 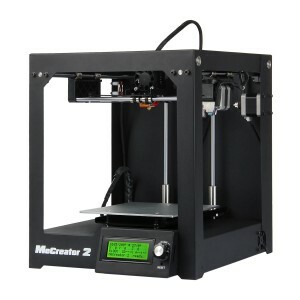 Printer is $128-nice price. Mandatory auto leveling sensor $26-fine Shipping $300!!! Must be a bad joke. Especially claiming "free shipping" on this webpage. Express shipping +$60. Who asked for that addition? To developers- I understand that you need to recover costs and the market is competitive- hence you sell cheaper than competition and get money back on shipping. But such practice is unethical and customers should be warned about your click & bait practice. come on! shut up they also have to make something & this technology is practically costing £0000000 now isn't a typical paper printer a little more expensive!! Price increases to $153.97 when I add it to the cart, and does not reflect free shipping as indicated in the listing. Hi Jeffrey ,sorry for the inconvenient here ,and for this printer is not free shipping as the price we give by without shipping ,the shipping fee will no need much .Do appreciate to your understanding here. Hi Tuan ,SOrry that this one is not free shipping and need add the shipping fee when you confirmed the order .The shipping fee also not too much . After ensamble... what next? Any tutorial for calibration and start-up? Hi Luis ,we have details manual ,also assemble vedio and details building instruction,Also if you still have problem you can email to our professional tech for help. can you deliver this to India or any existing distributor of yours in India ? Hi Akshay,pls place the order online and we can ship to india by DHL or fedex.Pls note with thank. Hi, does this 3d printer come with a mains plug, and if so what type would it be (I live in the UK)? Hi Collins ,will arrange the UK plug ,pls note with thank,. Hello! Do you make deliveries to Argentina? Hi Eduardo,yes ,can ship to Agentina by EMS .We have a distributor on Argentina too ,you can buy from him.